The strange green coin that I had obtained in my last voyage was definitely a hint. Me navigator was right with his theory and it was sheer luck that Nina's friends gave us the next clue. On this ancient map, a legendary emerald city was marked along one of the routes. The city was thought to be nothing more than a ruin of a time long past. These jade coins were once used in that city and are a rarity in these parts. If this coin appeared out of nowhere then there is definitely something to be found within these ruins. Contrary to the naming, the ruins were not actually green in color. The place was a mix of pewter shades lost in the dust. But lo behold, there was intense green light emanating from somewhere within the ruins. What was going on? My landing party triangulated on the source of the green light. It seemed to be a, tavern of some kind but our entry was prohibited by a burly man who asked for a Token. Instinctively, I held out my green coin to which the man smiled and let us enter. 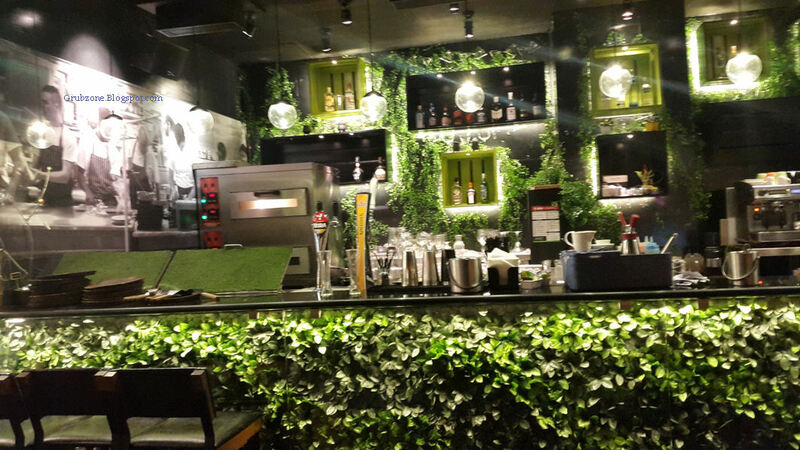 Literally resembling the Emerald city from the Wizard of Oz, Cafe Mezzuna is another venture from the people behind Mainland China and Oh Calcutta. 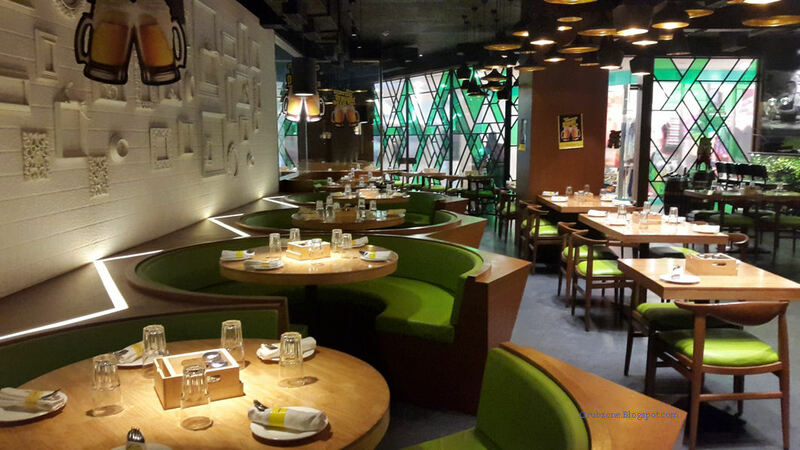 With it, comes the hospitality group's good taste for thematic ambiances and excellent service. Life can be chaotic in a mall like Infiniti and places like Mezzuna serve as a nice retreat from the noise pollution and third rate food court eateries. Cafe Mezzuna was quite full when I had arrived but I had a table booked for me (Yay me?). The vibes felt good and there was a feeling of placid comfort in the cafe. Without wasting much time I placed my order. Since I was going boozeless for the day, I started my sojourn with this creamy Mint Smoothie. It was enjoyable though I did expect it to be peppermint and not regular mint. A tasting platter made on request. Jalapeno Cheese poppers on the right were passable. A piping hot savory snack but I have had better. Pan seared Mushroom tarts with mozzarella and a balsamic drizzle were savory, cheesy and finger licking good. These were the perfect combination of the salty and the subtle savory. The ideal vegetarian appetizer for me. Spinach cheese sambousek at the top right felt very pedestrian and was perhaps the only thing that I chose not to finish on the platter. Potato Croquettes on the top with leek and cheddar were slightly tough but still a flavorful and savory appetizer. Captain : So much to eat on one little platter. Harissa spiced grilled cottage cheese skewers. Lets call this Johnny since the original name is longer than the Fellowship of the ring. 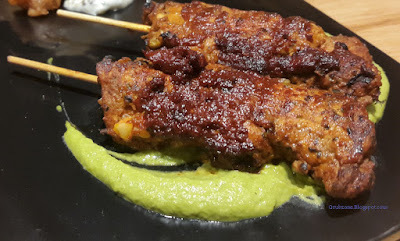 Johnny was spicy down to the very core and did not feel like paneer rubbed with spices like in most other places. Johnny was like a wall flower that turned out to be a bombshell in disguise. Johnny was good, keep calm and eat Johnny. Pan Grilled Mushrooms with chili, spices and lemon felt very much like the crispy corn in Mainland China. The flavor was not too over the top but still felt addictive. Seemed to be a perfect bar nibble or a great side to any meal. The mushrooms were not too soft but still juicy with flavor oozing out of every bite. 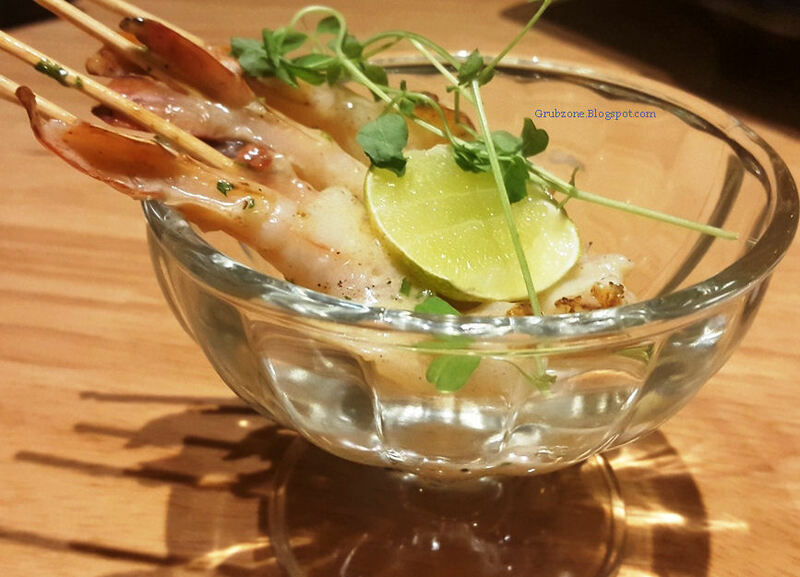 Grilled Prawn skewers were served in a style that made these appear like a luxury for the plebeians. And these tasted equally good. Garnished in an anchovy butter mixed with garlic, the flavor was really something else. Juicy, spicy and filled with the flavors of the ocean - this was one of the best Prawn based dishes that I have ever had. Captain : I wonder what clue will we find here. Who expected a Tavern to be here anyway? Crewmate : Maybe we should have brought the ship cat along. Captain : She did not want to get off the ship for this island. I think she hates green. Grilled Chicken Skewers were rubbed with Harissa and served with parsley hummus. 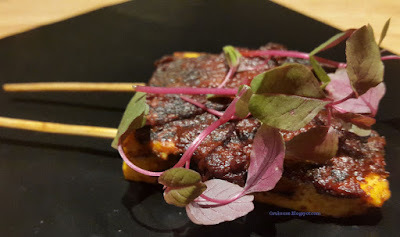 Strangely, I found myself like the Paneer skewers more oer here. The Harissa did not seem to suit the kind of cooking used here. It may have worked with the paneer but not with the chicken. 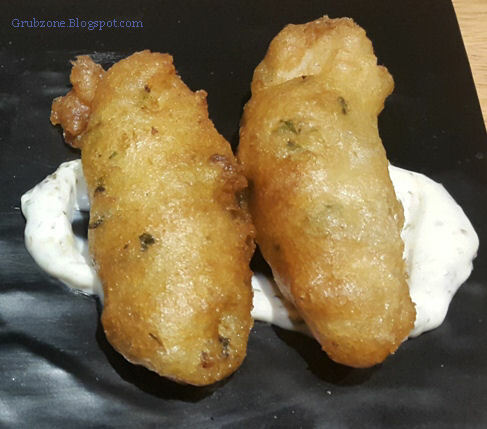 Beer battered fried fish served with lemon tartare. Melty basa is probably not the best kind of fish for deep frying. While the crust was flavorful and spicy, the fish core felt shallow and uninspired. This can be remedied by using a different fish. The Jerk spiced chicken pizza looked good, had the right ingredients but had a glitch with the flavor. 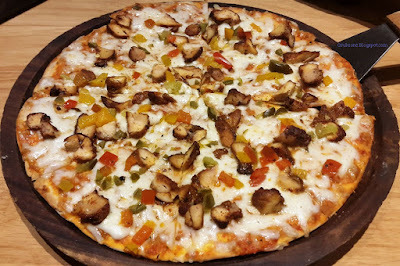 While the chicken used was indeed rubbed with Jamaican Jerk spices as billed, the flavor of the pizza was dominated by the Jalapenos and the Bell peppers. These ingredients had managed to neutralize the chicken's flavor and made the pizza feel more like a pico de gallo pizza. I feel that the veggies could be reduced and the chicken increased to keep the flavor meatier. 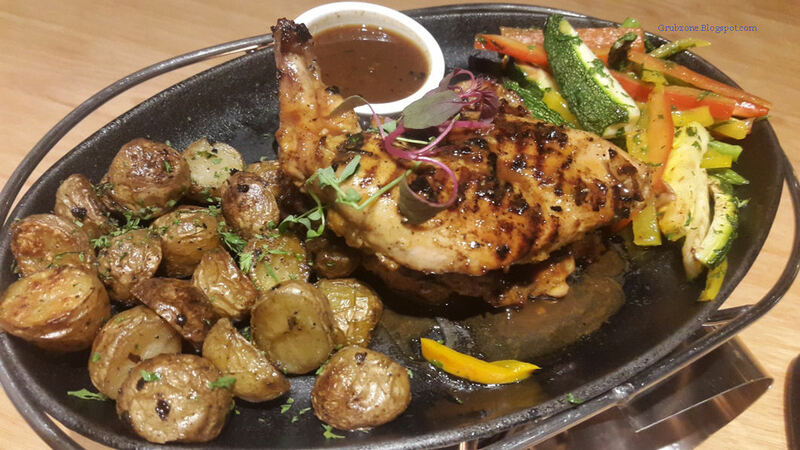 Stone Grilled Chicken was served in a most impressive manner with a side of potato salad and sautéed greens. It was served on a plate that was constantly being heated by a small burner. The chicken portions contained both a breast and a leg. The Chicken leg tasted great and was cooked perfectly. It was full of flavor and appropriately tender. However the breast portion was too well done. The edges had become hard and chewy. I pondered what could have happened and the only reason I can think of is that both cuts of the meat were cooked in the same temperature and manner - Probably being the leg cut's temperature since it turned out to be perfect. Vanilla Rock Dessert is an item that is going to be introduced shortly to the public. 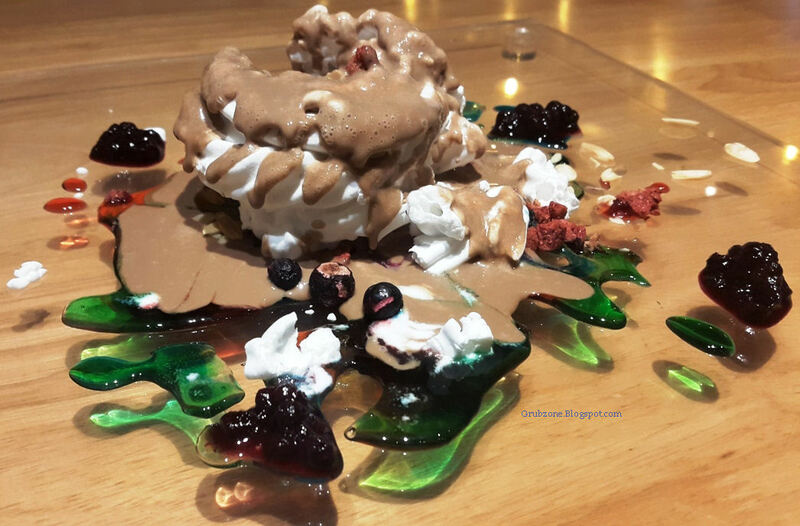 The blogging folk have been the first humans to beta test the dessert before it goes live. Using molecular gastronomy, a dollop of whip cream is snap frozen and then placed in a rainbow colored puddle made out of various syrups and fruit compotes. The thing is then generously showered with a nutella like hazelnut chocolate sauce. The desert works well as a novelty though mascarpone would make a better alternative than whip cream. Captain : This looks like a mountain of gems. Crewmate : It seems to follow symmetry with the colors. Captain : That being said, where would the next clue be? Passing Stranger : I could tell you, if you part with some of yer food. Captain : We don't deal with random tricksters. Stranger : Your call. You need all the help you can find for the Blue Compass. Captain : Who told you I was hunting for the Blue Compass? The service is stellar as mentioned before. The restaurant was adequately staffed and all tables were well attended(despite being crowded). The servers were professional as expected from a restaurant from Anjan Chatterjee's stable. The pricing is variable. Some items feel a bit on the higher side while some others feel quite cheap. I suppose that one's experience dictates of what they think of the pricing. To keep this brief, it seems to be on par with other Cafes and pubs. Cafe Mezzuna seems to have a lot going in its favor but suffers from quite a few glitches too. The appetizers here were really stellar while the mains could use improvement. However to sum up my experience, I think that I really enjoyed my trip to Mezzuna. Glad to see Specialty restaurants taking strides in the realms of Western food. Crewmate : So did that scamming old man give you anything? Captain : A piece of paper with numbers. Crewmate : What kind of numbers?